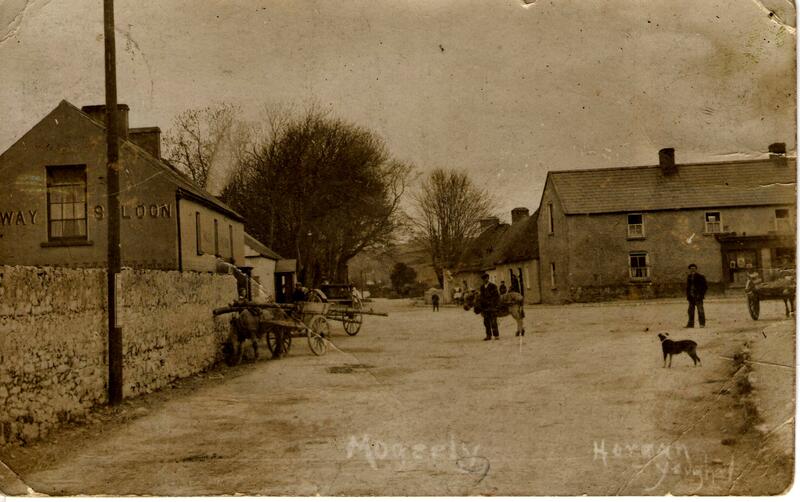 Mogeely, near Castlemartyr, County Cork, as photographed by the Horgan brothers of Youghal before 1910. This blog has already featured a postcard sent from Queenstown (now Cobh) to Ladysbridge in 1904 (see ‘The history that is lost to us as hinted in an old postcard.’ Posted January 2nd.) However, the postcard discussed in today’s post is, perhaps, more interesting, both for its local provenance and its pictorial subject matter. 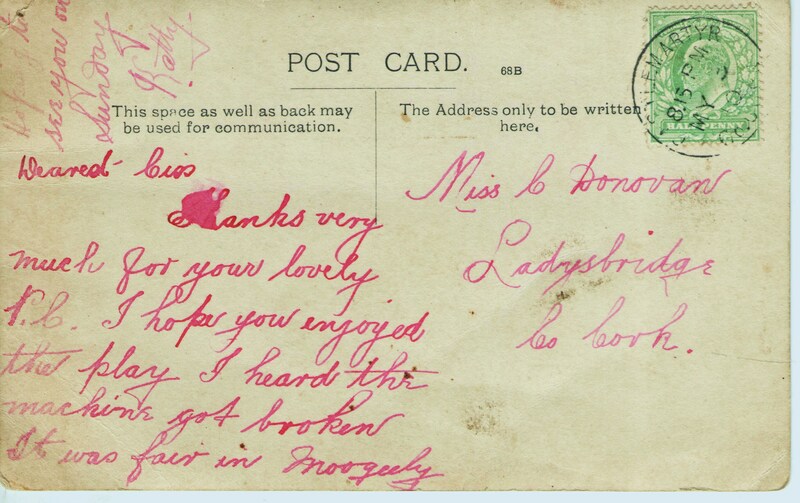 it makes your realise that before the age of texting, even before telephones became commonplace, the half-penny postcard was the way to send a quick message. The card was sent by someone called ‘Katty’ to Miss Ciss Donovan in Ladysbridge. The postmark on the green half-penny stamp depicting King Edward VII is dated May 3rd, 1910. This mark was impressed on the card at Castlemartyr Post Office at 8.15 pm that evening, clearly in preparation for delivery the following morning. It is almost certain that the card was actually posted in Mogeely, and stamped with the postmark during sorting in Castlemartyr. One other detail is of interest – the divided back of the postcard indicates that the card could not have been produced before 1902, for that was the year in which the Post Office introduced the divided back to separate the address from the message. There are two locations called Mogeely in East Cork – one is near Conna, not far from the Waterford county boundary and the town of Tallow; the other is further south in the barony of Imokilly, about six or seven miles east of Midleton and just a over a mile north of Castlemartyr. This small village of Mogeely, really a hamlet in 1910, is barely three miles due north of Ladysbridge, the destination of the postcard; Castlemartyr is situated on the road between them. The front of the card consists of a photograph the Horgan brothers of Youghal, famous local photographers and early cinema operators. They opened the first cinema in Youghal, but, more importantly, they took photographs of the towns and villages throughout East Cork and West Waterford in the first half of the twentieth century. In the evening, having taken their photographs, the Horgan brothers would retire to a local hostelry to present a slide show of the images to the local people as a way of saying thank you, and providing an early form of pre-cinema entertainment. Indeed such a show may have been the subject of the postcard’s message. Their signature is on the bottom right of the photograph. In this case the photographer has placed his heavy tripod box camera in the middle of the road leading from Castlemartyr to Mogeely. The site is very specific, because this road was crossed by the Cork to Youghal railway line directly behind the cameraman! Furthermore, it can be noted that the road is dusty, because there were very few motorcars in Ireland at the time and the roads were all designed for horse-drawn transport. There is no way a modern cameraman would take such a photograph today without all sorts of signs and traffic cones to ward off the busy rural traffic. The camera faced directly north into the village (really a large hamlet) of Mogeely. The road continuing due north between the cottages and the hedgerow trees leads to Dungourney, situated in the hills that can be discerned between the trees in the background. The road leading to the right heads east to Killeagh and Youghal. Behind the photographer, and beyond the railway line, there is a road leading to the left, west to Midleton. This road joins the main road from Midleton to Castlemartyr and Youghal at Churchtown North, two miles from Midleton. Because of the nature of the cameras at the time, it was necessary for the photographer to get the co-operation of the local people. The subjects had to stand still for a few moments while the camera captured the image – and this is what happened with this photograph of Mogeely. As you can see the people of the small village are present in force. They are posed in groups – a small group by the pub on the left, a larger group by the cottages in the background in the centre, and a man with his donkey in the middle of the road in front of them. There is another man stepping onto the roadway on the right, and in front of him a village dog got in on the act by posing perfectly on the road! There are only two buildings in the photograph that have more than one storey. All the rest of the village consists of single-storey dwellings, many of them thatched. What is interesting in this image is that the only concessions to modernity are the telegraph pole on the left, and the name of the pub – the Railway Saloon, otherwise the village looks very much like it did before the railway arrived in the 1860s. The romanesque revival church of the Sacred Heart in Mogeely was being built when the postcard was sent in 1910. Opened in 1912, its decoration was completed over many years. My great -great-grandfather cut the stone for this church, which was built by JJ Coffey & Sons of Midleton. 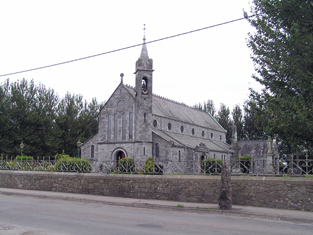 The church stands beside the road to Castlemartyr, just north of the railway line. To make matters more interesting, the photographer avoided any suggestion of the biggest event in the village’s history at the time – the building of the new Sacred Heart Church to replace the humble old village chapel. The site of the new church was immediately to the right of the photographer, out of picture. This church was started in 1908 and completed in 1912. Thank you very much for your lovely nib. I hope you enjoyed the play. I heard the machine got broken. It was fair in Mogeely. In the upper left corner the message ends: Hope to see you on Sunday. Presumably the nib in question is the one that was used to write the message and address in red ink. The ‘play’ is likely to be the slide show put on by the Horgan brothers that evening, presumably in Ladysbridge for the locals there. The reference to the ‘machine’ breaking down suggests that there was a technical hitch during the show. And the note that ‘it was fair in Mogeely’ does indeed suggest that the breakdown happened during a show in Ladysbridge – it’s hardly a reference to the weather given the proximity of the two villages! Finally, Sunday was the normal day for visiting and greeting friends and family, being the only day off during the week. Since I have family connections to Ladysbridge, I would love to see the slides that the Horgan brothers showed that evening in Ladysbridge. I’m not certain if they are among those images from the Horgan Collection made available online by the Cork County Library. Unfortunately Miss Ciss Donovan is not named in the 1911 census for Ladysbridge – she had either moved away, or married and moved away. As for Kattie – there are several candidates. However, I suspect, but cannot prove that our Kattie may be Kate Harte, aged 30, of House 7 in Mogeely, wife of the blacksmith John A Harte. Mogeely’s history goes back a long way – it was certainly extant when Robert FitzStephen and his band of knights invaded Cork in 1177. The site was almost certainly a parish by that time and fragmentary remains of the medieval church are extant in the local graveyard. Mogeely seems to have been the seat of the local ruling family, the Ui Mac Tire, before the Anglo-Normans arrived. In 1182, the Mac Tire clan murdered a party of five Anglo-Norman knights, on their way to a parley in Waterford, sparking off a general revolt against the invaders in Cork. In the 1640s a senior Anglican clergyman, collecting evidence of Catholic atrocities against Protestants during the 1642 rebellion was murdered nearby. These murders will be the subject of a future post. The fragmentary remains of the medieval parish church of Mogeely are situated in the centre of the grossly overcrowded old graveyard. When the new church was completed in 1912, the old early 19th century chapel next to this graveyard was taken down and its site was later incorporated into the graveyard. My grandparents were buried in this new section. Both Mogeely and Ladysbridge have expanded considerably since the postcard was sent in 1910. This is due to the building of housing estates on the edges of the villages. But the centre of each village is pretty much as it was in 1910. Now I must declare a personal connection to both Mogeely and Ladysbridge. At the time the postcard was sent, Mogeely’s new church was being constructed by the firm of JJ Coffey & Sons of Midleton. My own great great grandfather on my mother’s side was a stonecutter who worked for Coffey’s. He cut and dressed stone for this church. My paternal grandparents came from Wexford, but eventually settled in Ladysbridge. Both are buried in Mogeely graveyard. 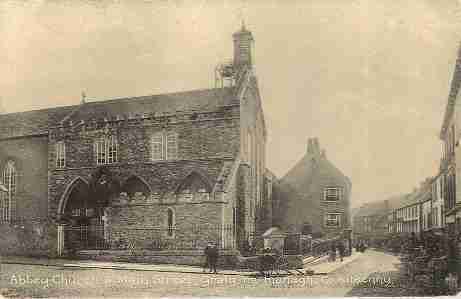 My thanks to Jim Horgan of Youghal for encouraging me to publish the images of the postcard, and to my aunt loaning it to to me.. The Horgan Collection can be found under the library’s Digital Collections link. In 1278, Duiske Abbey in Graiguenamanagh bought out the land holding of David le Harpur at Coppenagh, in County Kilkenny. This photo shows the abbey church in the late 19th century. The church has been superbly restored since the photograph was taken. Some years ago I discovered that there was an interesting document in the National Library of Ireland. This was a quit claim pertaining to a parcel of land in the townland of Coppenagh near the eastern edge of County Kilkenny, not far from the village of Graiguenamanagh. In fact the document even mentioned Graiguenamanagh in its guise as the Abbey of Duiske. The document noted that the man who signed it had inherited the land in question from his grandfather, Robert. The name of the man who issued the document was David le Harpur. The date was February 18th 1278 (hint, check your calendar!). Basically the document recorded the transfer of lands to the Cistercian Abbey of Duiske by David le Harpur and his landlord Raymond Roche. Sadly the original document from 1278 hasn’t survived, so National Library of Ireland manuscript D.287 is a sixteenth century copy of the original made for the Earl of Ormond, who was awarded the lands of Duiske at the Reformation. Ormond was clearly intent ion ensuring that no Harpur would ever reclaim the land at Coppenagh! What I love about this document is that it names David le Harpur and his grandfather, Robert – the original Anglo-Norman occupant of the land. Clearly Robert le Harpur must have come to Ireland in the year 1169 or very shortly thereafter. If we didn’t come on the first ship from Pembrokeshire, the Harpurs of Ireland surely came on the second one or third one! Sadly the passenger lists didn’t survive the centuries – if there ever were any. But at least we can look the FitzGeralds, Carews, Barrys in the eye as equals. We might even have been here before the Butlers – just! For some time I thought this particular document was the earliest documented reference to my family name in Ireland, but I was wrong. 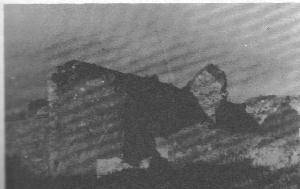 Twentieth century image of the ruins of Harperstown Castle in County Wexford – there’s even less to see now. It seems we are linked to a ‘Sir William le Harper’ or Harpur who is sometimes described as Strongbow’s harper (well the surname had to come from somewhere!). Sir William was granted the lands of Aghdare which he, or a successor, renamed Harperstown. Aghdare means the ‘ford of the oaks’ – just like Adare in County Limerick! A later successor was David le Harpur who held three carucates of land in Aghdare in 1324. That’s a mere 360 acres – hardly a vast estate, but a comfortable landholding in the fourteenth century. Note how the name David keeps cropping up – a sure sign of Welsh origins, after all St David is the patron of Wales. Raise a toast to him on 1st March, his feast-day. There were extensive ruins of a castle and house at Harperstown in the later 19th century. There is some argument over whether that original Sir William le Harpur or a second man of the same name built the castle – suspicion must fall on the second fellow because the ‘castle’ was a tower house – a gentleman’s fortified mini castle, the equivalent of a small English manor house. Such buildings only come into being in Ireland, the north of England and Scotland from the mid-1300s. The main line of the Harperstown Harpurs ended in a daughter, Agatha, who married William Hore in 1336. She took the entire inheritance with her, so Harperstown in County Wexford was a chief seat of the Hore family for centuries thereafter (they had it until 1878!). At least the property went to another Anglo-Norman family, thanks to the Great Hore of the Harpurs! Happily, I can write about the family Hore without any shred of embarrassment. Although I have to confess that I feel that some of this story seems too good to be true. The fact that Aghdare townland was renamed Harperstown does suggest that at least one branch of the family were a cut above the rest as minor gentry. I really should have issued a health warning in respect of the above tale of Sir William Harpur. The health specialists now tell us that all the stuff about avoiding salt is overstated – salt is good for us, so take the story of Sir William le Harpur with a good dose! The fact that great-great-great-great-great-etc. (ad infinitum!) aunt Agatha married William Hore in 1336 makes the tale of Harperstown Castle suspect. The Harpurs almost certainly had a house on the site, but I suspect the tower house was built by the Hores. So we can’t even claim credit for the castle, however ruinous! But we CAN claim to have given our name to a townland a few miles due south of Taghmon in County Wexford – Harperstown. This is bordered on the north east by the townland of Harveystown, on the east by Youngstown and on the south by Waddingstown! Harvey and Wadding are both grand old names from Wexford. There’s even a Horestown – which must make life interesting for the postman. On the first edition Ordnance Survey map it is clear that Harperstown is virtually a private demesne of the Hores, and is heavily planted with trees. Just north west in the townland of Augfad is a junction of five roads (one is actually the driveway into Harperstown House) called the Hand of Harperstown, presumably for a five-fingered sign-post that must have stood there. 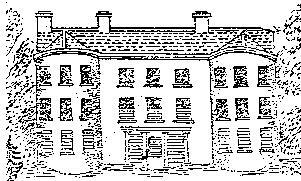 Sketch of Harperstown Castle – this is actually the country house erected by the Hore family who held the place much longer than the Harpurs. Let’s tease out the Wexford links before dealing with the Ballinacorra Harpurs in County Cork. We know that the lands of Bargy and of Forth were granted to Robert FitzStephen and Maurice FitzGerald, to be held jointly (see my previous post). This suggests that the settlers from Wales and England were brought over by FitzStephen and his Carew heirs as well as FitzGerald. Now we know from my previous post on Ballinacorra that Robert FitzStephen was one of the two men given leave to conquer the kingdom of Cork in 1177 – and his lands there included Imokilly. FitzStephen’s heirs in Cork were the Carews – keep that fact in mind for the moment. The main dual carriageway from Cork to Midleton crosses Harpers Island just to the right (east) of the green emblem indicating E30 – the official name of the road. The railway from Glounthaune to Fota crosses the island from north to south – Harpers Island only became busy in the late 20th century! Now, I was long aware of the existence of Harpers Island in the inner reaches of Cork Harbour, lying between Fota Island and Glounthaune. I had assumed that this was linked to a family called Harper who had a house on Great Island in the later 1700s and early 1800s. They seem to have been later arrivals, probably Cromwellian or Williamite settlers – but that could be wrong. However, the Down Survey maps drawn up for the Cromwellian government shows the name in use by the 1650s. Clearly the island had the name since the middle of the 1600s, but does it go back further? At present I have no idea. Harpers Island is the spit of land marking the upper edge of this body of water off Glounthaune (the village in the foreground). The island is utterly flat and even has reclaimed land – almost like a Dutch polder. And yes, I know the spelling is different – Harper rather than my own Harpur. When I was learning to spell words in primary school, one of the first things I tried to do was write my own name. I wrote HARPER – which made a lot of sense to a five year old. But my mother corrected me – it was HARPUR. Which did not make sense to a five year old!.But she insisted so I stuck with it. In fact the spelling of the name did change over the centuries – le Harpour, le Harpeur, le Harpur, Harpur, Harper. My own line, and others from Wexford, preserved the HARPUR form. Another group of families with the name Harper moved into Ulster in the seventeeth century – they were Protestant planters. Among them were Harpurs from Scotland – a branch of the Buchanan family, and staunch Presbyterians. These families do not seem to be related to my bunch. 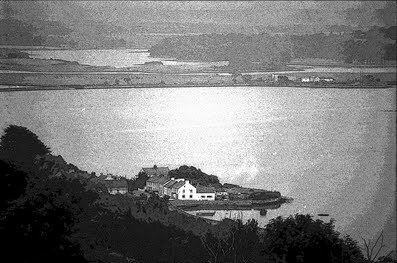 The train from Cork to Cobh crossing the causeway from Glounthaune onto Harpers Island. From there it proceeds to Fota which has its own station and then on to Cobh. Harpurs Island made the building of this railway much easier in the 19th century. Paul MacCotter mentioned in his historical introductory essay in Jeremiah Falvey’s Chronicles of Midleton that the Harpurs were among the earliest Anglo-Norman settlers of Ballinacorra. I had a chance recently to ask him for further details – warts and all! And he kindly gave me the sordid details. You may recall from my previous post that many of the Anglo Norman settlers in Imokilly share names with Anglo-Norman settlers in south County Wexford. Clearly there are family relationships at work here – after all, the Carews, FitzGeralds, Barrys and others were all related. The Anglo-Norman ‘invasion’ of Ireland was a family enterprise. The overall leader, Richard FitzGilbert de Clare, Lord of Striguil, known as Strongbow, was the odd one out being barely related to the rest of the party, if at all. So my suspicions are raised by the FitzStephan/Carew links between Bargy and Forth in Wexford and Imokilly in Cork. Bear in mind that, at this early stage, the FitzGeralds also had a short-lived foothold in Imokilly. But the Harpurs identified in Ballinacorra by Paul MacCotter were also settled on Carew lands. The baronies of Bargy and Forth in south Wexford were shared between Robert FitzStephen and Maurice FitzGerald. FitzStephen’s share was inherited by the Carews. The Harpurs were settled in Bargy in the century following the Anglo-Norman arrival in 1169. The links between this area and Imokilly were very strong – because FitzStephen took Imokilly from the local Irish lords. The Carews probably settled people from Bargy and Forth in Imokilly. The earliest reference for the Ballinacorra Harpurs is 1260, when Henry le Harpur was impleaded by Richard de Carew for 14 acres in the vill of Castle Corth. Basically Henry Harpur was arguing with his landlord over possession of 14 acres in Ballinacorra, and the landlord took him to court. It is not certain if the Richard de Carew named here was the son or grandson of the Richard de Carew who bought the manor of Castle Corth/Ballinacorra from Thomas des Autres in the 1190s. The second mention is more sordid. John, son of Theobald le Harpur, was accused of violent disseisin with members of the Cod family at Ardraha near Cloyne in 1295. There was a row between John le Harpur and the Cods of Cloyne – and violence was used, or threatened. I wonder if it was over land? That could cause a row! The last mention is from 1336 – now that’s an interesting date because it is shortly before Thomas de Carew sold Castle Corth or Ballinacorra to William de Barry. There is simply a mention of a David le Harpur residing at Castle Corth – he’s probably a burgess or townsman, a tenant of the estate, with a small plot of land. There seems to be no further reference to the Harpurs of Ballinacorra after that – perhaps the Black Death finished them off in 1348. But note the year 1336 – this was also the fateful year in which Agatha Harpur of Harperstown in Wexford married William Hore. It’s been downhill since. There’s more research to be done here, but one thing is clear – the Harpurs of Ballinacorra must have been settled in Imokilly after 1220 by the Carews. And they probably came from County Wexford – just like my father’s family. No wonder I feel so much at home here in Midleton! Now if only we can reclaim Harperstown….or maybe Harpers Island. I fear asking for the return of Coppenagh might be too much to hope for (sigh). Many thanks to Paul MacCotter for the information on the Harpurs of Ballinacurra given above! Before Midleton – there was Ballinacorra……. It makes no sense to discuss the early history of Midleton without considering the older, and now overshadowed,neighbour, – the village of Ballinacorra. So I’d like to examine some aspects of Ballinacorra’s history here. I must acknowledge my debt to Paul MacCotter, who, as an excellent medieval historian, has presented so many insights into the history of the area around Midleton and Cloyne. 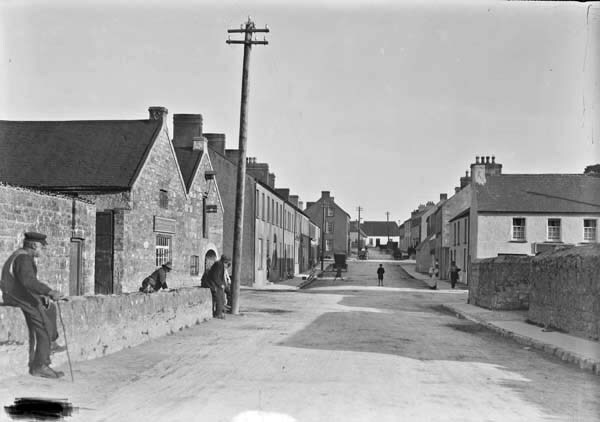 The Main Street of Ballinacorra around 1900. The building on the left might stand on the site of the mill recorded in 1301. The modern village looks very much as if it had been planned, and perhaps it was redeveloped in the later 1700s. Flowing under the road in the foreground is a culverted stream. The village of Ballinacorra still retains its own identity despite being considered by many to be simply a suburb of Midleton. It is far enough away from Main Steet in Midleton to treat the larger town as an interloper. In the decades since the 1960s, the main road from Midleton to Ballinacorra has become built up, especially on the west side from Lakeview filling station (that’s a gas station to you Yanks!) to the Dark Road (‘dark’ because it was heavily shaded by trees). The eastern side of the road had just Lakeview Terrace and a couple of houses, along with Lakeview House itself. There were fields between the Presentation Convent boundary wall, which marked the southern end of Midleton town, and Lakeview filling station, and there are still fields on the eastern side between Lakeview House and the other houses on that side of the road. However, the building of ‘The Cotswolds’ (!) and ‘Castleredmond’ housing estates has filled in some of the open space. Charleston House still stands proudly isolated behind its high wall, trees and mercifully green fields on the western side of the road, directly opposite the entrance to the Castleredmond estate. Should the demand for housing boom again, it is likely that all the land bordering this road will be built up. Ballinacorra Creek runs from the bottom left to the center right. The sharp straight end of the creek is the modern road from Midleton to Whitegate, cutting Ballincorra village off from its waterfront. The village proper lies byond the white line of the road. Ballinacorra house, with its adjacent farm buildings, lies at the bottom of the picture next to the creek. The strange bent wall visible at the bottom of the ploughed field, just above Ballinacorra House, draws the eye to the site of the medieval church, and the trees which surround and cover the mound that marks the Anglo-Norman motte or earthwork castle – Castranachore. The waterway coming in from the upper left is the estuary of the Owenacurra River, which flows through Midleton. One important change in the road between Midleton and Ballinacorra was the rebuilding of that road since the 1950s – which entailed by-passing Ballinacorra and even filling in part of the waterfront thus cutting the village off from Ballinacorra Creek. 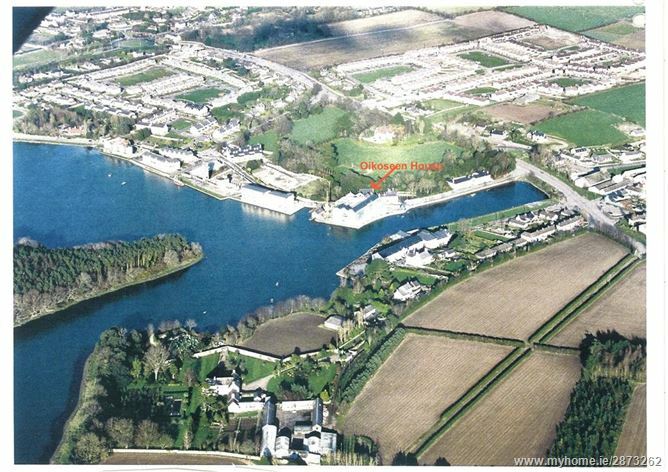 This waterfront and its quays were the reason for the village’s whole existence in the first place. During the building of the Whitegate Oil Refinery in the 1950s, it was realised that the old road was inadequate and a narrow turn in the road at the top of the Main Street in Ballinacorra to Whitegate made it difficult to get large vehicles through the village. The solution therefore was to widen the road from Midleton to Whitegate, and it was necessary to by-pass Ballinacorra because the narrow Main Street was too constricted. Thus Ballinacorra became one of the first villages in Ireland to be by-passed. Today, when driving from Midleton to Whitegate on the R630, it is easy for the motorist to overlook the existence of the village because the road was laid out on a raised embankment which filled the eastern end of Ballinacurra Creek. This causeway was necessary because the road had to drop down a steep slope from Castleredmond, cross the Creek, and climb up the steep slope on the other side leading into Ballinacorra townland and continuing to Whitegate. In effect, Ballinacorra became lost in a hole, as well as being cut off from its historic waterfront by this wide, busy road and fast traffic. You get a better idea of the difficulties posed for the engineers when you turn off the main road into the village itself and drive up the Main Street to rejoin the main road further on. As mentioned in my previous post, Ballinacorra is a much older settlement than Midleton. It was certainly extant in the middle of the twelfth century, and perhaps earlier. By 1160, the parish had been created as part of the organisation of the newly re-established diocese of Cloyne, the cathedral of which was just a few miles away (literally in the next parish!). It is likely that, as with Ballycotton, the site at Ballinacorra was developed as a port for Cloyne – indeed Ballinacorra was a much more secure port for shipping. Despite being located about nine nautical miles from the sea, Ballinacorra’s sheltered position, its proximity to Cloyne (compared with Ballycotton) and its access to the rich grain growing lands of the vale of Imokilly, made it a good spot for a port. The land may have been controlled by the Ui Mac Tire family – a bunch of parvenues who had recently usurped older ruling families to take over as the local lords of Ui Mo Caille or Imokilly. Imokilly is now a barony stretching from Midleton to Youghal and southwards to the sea. In the twelfth century only the western part of the modern barony from the present day Castlemartyr/Mogeely (& Ballymacoda?) 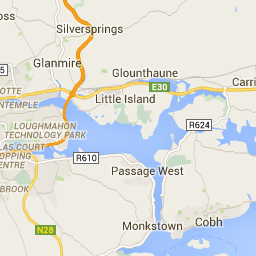 line to Midleton and the eastern shore of Cork Harbour was called Imokilly, but it was later expanded to Youghal. Originally the barony included the territory stretching towards Carrigtohill, but these lands were incorporated into Barrymore well before 1500. Th original lands of Imokilly seem to have been controlled by the Ui Mac Tire in the north and the Bishop of Cloyne in the south. The Ui Mac Tire were closely allied to the MacCarthy dynasty who ruled the kingdom of Cork or Desmond (South Munster). Indeed it likely that the MacCarthys re-established the diocese that had been extinguished at Rath Breasail. in 1111. They also seem to have been closely linked to the church reforms that had been in progress since 1111. Perhaps Cormac MacCarthy, the man who built Cormac’s Chapel on the Rock of Cashel, was the re-founder of the modern diocese of Cloyne! The MacCarthy kings were closely linked to the church reforms that were in progress in twelfth century Ireland, and their close allies the Ui Mac Tire may have followed suit. There’s an interesting German connection here that will be addressed in a later post! The parish of Ballinacorra covered much of the area that was later covered by the civil parish of Midleton. A civil parish is effectively the medieval parish; today the civil parish provides the basis of Church of Ireland parish unions and is also of Roman Catholic parishes, although Catholic parishes might be drawn up to ignore civil parish boundaries. However, in 1180, the large parish of Ballinacorra was divided in two. 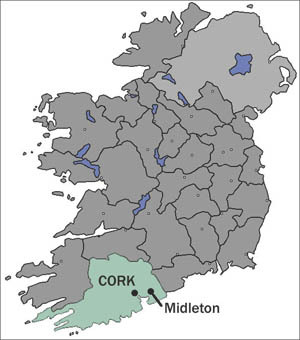 The northern portion of the parish was given over as a separate parish to the Cistercians who settled at Chore on the site of today’s Midleton town. The southern portion of the original parish remained as the parish of Ballinacorra or, as it later bacame, Castranachore – a name still applied to the whole civil parish in the Tithe Applotment Book of 1833. We know that Ballinacorra was established before the arrival of the Anglo-Normans in the area in 1177 because the parish church was dedicated to St Colman of Cloyne. This dedication to a native Irish saint invariably indicates a pre-Norman foundation. In this case it also suggests an older direct link to the monastery of Cloyne, which had become the Cathedral of Cloyne. The west end of the ruined church at Ballinacorra. This view shows the typical later medieval west end of an Irish parish church – there’s no door, for that is on the south side of the church. The image is taken from the edge of the churchyard overlooking Ballinacorra Creek. The church is right on the water’s edge. The location of the medieval church in Ballinacorra, right on the southern shore of Ballinacorra Creek, strongly suggests that Ballinacorra was envisaged as a port for both the town of Cloyne, and for the Mac Tire lands. The grain grown in Imokilly could easily be transported to Cork by boat or ship from Ballinacorra – a trade that continued into the twentieth century. It might be thought that Youghal would have been the principal port for the area, but the dedication of that parish to St Mary suggests that Youghal is a later foundation of the Anglo-Normans. In 1177, King Henry II gave two of the original leaders of the Anglo-Norman expeditionary party in Ireland the right to seize the kingdom of Cork. This broke the Treaty of Windsor which had divided Ireland between a territory under Henry and the rest of the country under Rory O’Connor, the so called ‘High King’ of the Irish. The two men given this license were Robert FitzStephen and Milo de Cogan. These ruthless men promptly swooped into Cork – with the land of Imokilly being the first to fall victim to their raid. FitzStephen claimed Imokilly and Olethan. He subdivided much of the land into smaller estates for his knights. These knights then rented out the land to smaller tenants – in some cases they left the lands in the hands of the Irish families that had originally claimed it, as long as they paid rent to their new landlords. This was done because there seem to have been insufficient Anglo-Norman tenants to go around. Robert FitzStephen had granted much of Uflanethe (the plain between Midleton and Castlemartyr/Mogeely) to the father and son team of Robert and Thomas des Autres. It is uncertain if the des Autres were the new landlords to the Mac Tire family of if FitzStephen was their immediate landlord. Whatever it way the arrangement was worked out, the Mac Tire still occupied Mogeely and held what is now Midleton, with Castleredmond, the two Broomfield townlands, and Killenamanagh near Mogeely. The des Autres continued to hold lands in Imokilly throughout the medieval period, but in increasingly smaller holdings. This family is most likely the modern Waters and probably the Salter family that can be found in East Cork today. Indeed Paul MacCotter suggests that they give their name to several townlands, including of Ballintotis – the former Balyogy became Baile an tAiteirs (des Autres town) perhaps from the family’s possession of Ballintotis in the fourteenth century. 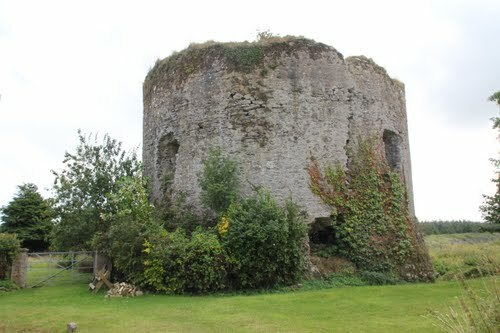 The des Autres may have established their caput, or seat, at Ballincorra by building an earth and timber castle there. Thus Ballinacorra became Castlecor or Caislean na Cora. This earth and timber castle may represented by the unexcavated tree-covered mound in the grounds of Ballinacorra House. This steep mound is located just yards from the medieval church – the relationship suggests a classic example of Anglo-Norman manorial practice: church and castle (or manor house) being set side by side. The location of the medieval village is unknown, but most likely it was on the site of the present village. It is even possible that the village was originally on the site of Ballinacorra House but the building of the castle meant that the inhabitants were forced to move to the site of the modern village. 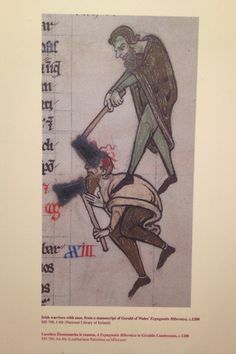 This high-handed behaviour was common enough among the Anglo-Norman elite. The eighteenth century wall separating Ballinacorra House from the old churchyard. The trees mark the site of the still extant mound, which appears to be the motte of the early Anglo-Norman castle that gave the village its other name – Castle Cor or Castranacore. The proximity of the castle to the church was typical of the Anglo Normans. It is possible that the original village was moved east to its present site when the castle was established on this site. This type of high-handed behaviour may have precipitated the foundation of the Abbey of St Mary of Chore (Midleton) in 1180 by Mac Tire and the Bishop of Cloyne (perhaps with encouragement from the MacCarthys). By handing some of their property to the Cistercians, the Mac Tire kept it out of the hands of the Anglo-Normans. . In a deed that is hardly later than 1183, Robert des Autres granted the tithes of three churches in his lands to St Thomas’s Augustinian Abbey in Dublin. One of these grants was ‘the great church of Castello de Cor.’ No, this referred not to a place in Italy but to the church at Ballinacorra (or Castlecor as it was now called). Note the name of this castle – it will come up, and cause trouble, in a later post! In 1182 a party of Anglo-Norman knights travelling from Cork to Waterford stopped off for the night at Mac Tire’s house in Mogeely – and were murdered. This incident sparked off a widespread revolt against the Anglo-Normans in Cork and the MacCarthy king, Diarmaid, launched a massive attack on Imokilly. All the castles of Imokilly were destroyed – including Castlecor. This revolt was suppressed by Raymond le Gros in 1183, but the Mac Tire and MacCarthys continued to fight a guerilla war until about 1220. All this suggests that the initial Anglo-Norman settlement was rather weak and that the new estates must have suffered from the conflict. Perhaps the des Autiers suffered severe damage to their properties during the revolt and its suppression as well as ongoing troubles into the early 1200s. With Robert FitzStephen’s death in 1183, his estates were inherited by his nephew Raymond le Gros, the same man who had suppressed the Mac Tire/MacCarthy revolt that year.It isn’t certain when Raymond died, but it was sometime between 1185 and 1198. Raymond’s lands were inherited by his nephew, Richard de Carew. Since we know that Thomas des Autres sold the vill and castle of Cor (Ballinacorra) to Richard de Carew in the 1190s, we can surmise that Raymond was probably dead by the middle of that decade. The status of Castranachore/Caislean na Cora/Castle Cor/Castle Corth now changed as de Carew made it the caput or capital of his large manor which seemed to correspond to the old territory of Uflanethe. This manor stretched from near Carrigtohill in the west almost to Killeagh in the east with a portion reaching the sea at Garryvoe and Ballycrenane in the south east. From north to south, the manor reached from Dangan to the northern outskirts of Cloyne. 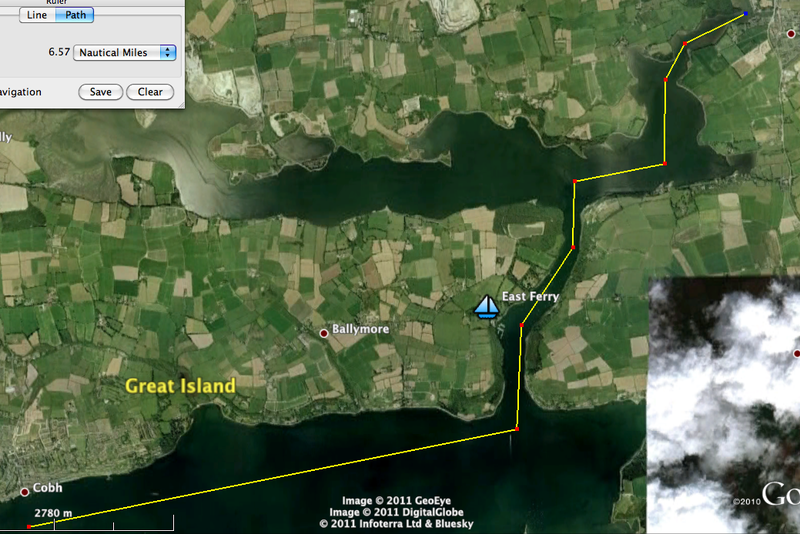 The manor of Castlecorth also included the eastern portion of Great Island (Templerobin parish?) and a larger detached portion around Aghada, where the original caput seems to have been located by Robert FizStephen. Being at the center of the manor, Ballinacorra (or Castlecorth, as it was called) was a busy market town and very useful port. This was effectively the most important town in Imokilly along with Cloyne and the newly developed port of Youghal. Later medieval documents show that, by 1301, there was a watermill in the town (perhaps on the stream that flows into the creek). There also seems to have been a leper hospital in the vicinity of Castlecorth – but no remains are extant today. To inhabit their new capital, the Carews seem to have brought in settlers from elsewhere – particularly from south Wexford. It is interesting to note that Robert FitzStephen was awarded a half-share of two cantreds or baronies in south County Wexford by Dermot MacMurrough. These were the baronies of Bargy and Forth on the south coast of the county (indeed on the extreme south east corner of Ireland – the point of Ireland nearest to Pembrokeshire, whence came the original Anglo-Norman forces. Families with names like Walsh, Burgess, Coppinger, Tanner, Dene, Cod, Field, Fleming, Marshall, Mynes and even Harpur all settled in Ballinacorra from 1220. The names of these settlers were remarkably similar to the names of the Anglo-Norman settlers in Bargy and Forth – almost certainly they were all related, perhaps younger sons in search of more opportunity. Paul MacCotter, who has had a chance to study some of these names, is very clear that this is a very close relationship between the families settled in south Wexford and in Imokilly, a relationship that deserves further exploration, especially since the Carews also inherited Robert FitzStephen’s property in Wexford. Events in the fourteenth century brought about some serious changes in Ballinacorra/Castlecorth. 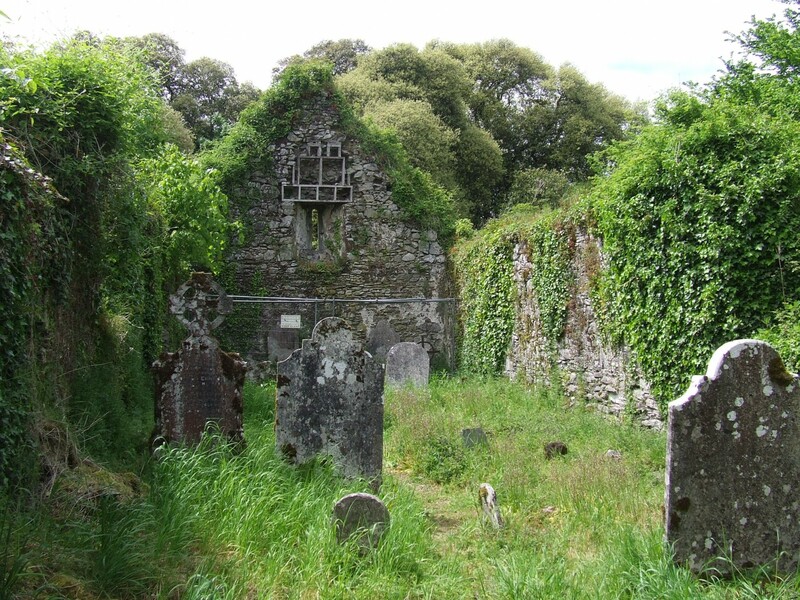 Firstly, a strong Gaelic revival led by the MacCarthys meant that Thomas Carew, sixth lord of Castlecorth after Raymond de Carew, lost much of his valuable estates in West Cork. In 1339 he sold the Burgary (town) of Castlecorth to William de Barry, the brother of David Barry, the lord of Barrymore. The result of this was that Ballinacorra/Castlecorth ended up in Barrymore barony until the later 1600s or early 1700s. This didn’t just mean the village or town of Ballinacorra, it also included the three townlands of Ballinacorra (town/East/West), the two Bawnards (East/West), and Loughatalia. To make matters worse, Thomas Carew was attainted for treason in 1340 and his manor of Castlecorth was confiscated by the government, although it was reluctantly allowed to remain under the tenuous control of the Carews of Garryvoe. The separation of the vill or town of Ballinacorra/Castlecorth from the manor of Castlecorth was disastrous. The port still functioned, but the town was no longer the center of economic activity in the western part of Imokilly. 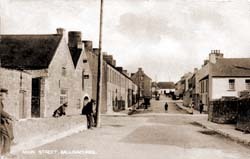 In the following century as the FitzGeralds re-established themselves in Imokilly, the focus seems to have shifted to the newer town of Castlemartyr. The grainstore built by Anderson and Lapp in the late 1700s and later acquired by John H Bennett & Co, maltsters. This image shows the buildings before they were converted into apartments. The lovely still water shows what the creek looks like at high tide. Sadly Ballinacorra Creek was allowed to silt up in the twentieth century and eventually closed as a port in the 1960s. Edward Bransfield RN was born in Ballinacorra about 1785, and was press-ganged into the Royal Navy in 1803. Unusually, for a Catholic, he did well for himself, rising through the ranks, becoming a noted early explorer of the Antarctic. Very likely his hedge-school education equipped him to take advantage of any opportunities that presented themselves to him, unlike most impressed men at the time. It would seem that Ballinacorra (as we must now call it) revived in the later 1700s, when Anderson and Lapp, two Cork merchants built quays and grain stores on Ballinacorra Creek. Later the malting of barley became the most important industry there, supplying malted barley to several breweries, including the Guinness brewery at St James’s Gate in Dublin. By then however, the creation of the borough of Midleton in 1670 meant that the northern neighbour overshadowed the village of Ballinacorra. In 1803, a young fisherman called Edward Bransfield was press-ganged from his father’s fishing boat into the Royal Navy. The young man remained in the navy after the final defeat of Napoleon in 1815, spending his time exploring the Southern Ocean and the shores of Antarctica as well as the South Shetland Islands, which he claimed for King George III (who actually had died the day before!). Sadly, the port at Ballinacorra was finally closed in the 1960s, thus ending centuries of international trade from the Creek of Ballinacorra. Did Dermot Mac Murrough set sail from East Cork to bring the Normans to Ireland? Archtraitor or just another twelfth century Irish politician? This medieval image is thought to represent Diarmait Mac Murchada, King of Leinster – the man who brought the ‘English’ into Ireiand. Diarmait MacMurchada (also known as Dermot MacMurrough) is a name perennially linked to treason in Ireland – although it’s a bit rich considering the propensity of medieval Irish kings to betray almost any agreement made in good faith! But what blackens MacMurchada’s name for most Irish people was his decision to seek aid from King Henry II of England to recover his Kingdom of Leinster, particularly his direct patrimony of Ui Cinnsealagh (the area now covered by the dioceses of Leighlin and Ferns – essentially Counties Carlow and Wexford). But most people in Ireland interpret this to mean that MacMurchada brought the English into Ireland in 1169, and so began eight centuries of trouble here. In reality Ireland was politically troubled before the events of 1169 – and there was no guarantee that this would end any time soon. Modern Irish historians now recognize that Mac Murchada was doing exactly what any Irish king might attempt – seek help to regain his kingdom and get revenge on his enemies. An Anglo-Norman takeover of Ireland was almost certainly not on the agenda. It is likely that Mac Murchada behaved like any modern politician and lied about some things. Besides, Henry owed Mac Murchada, for the King of England had hired mercenaries from MacMurchada to put down rebellion in Wales. But what has an exiled king from County Wexford got to do with South East Cork? Well, MacMurchada may have sailed from the mouth of the Dissour River (just north of Ballymacoda) to seek aid from King Henry II! I came across this when looking for something else…..and, as you can imagine, my jaw dropped. Ballymacoda is a long way from South Wexford – and was an even longer journey in the middle of the twelfth century! I’d better give a short synopsis of the events leading up to this departure. Diarmait Mac Murchada was born around 1110 as the son of Donnchad Mac Murchada, King of Leinster. Diarmait was descended from Brian Boru through his father’s grandmother. When Diarmait was about five, his father was killed by his own cousin, Sitric Silkbeard, King of Dublin (he was an Irish Viking, to put it crudely). Donnchad was buried in a grave with a dead dog for company – an insult the Mac Murchadas never forgave. This incident gives you a flavour of Irish politics at the time. 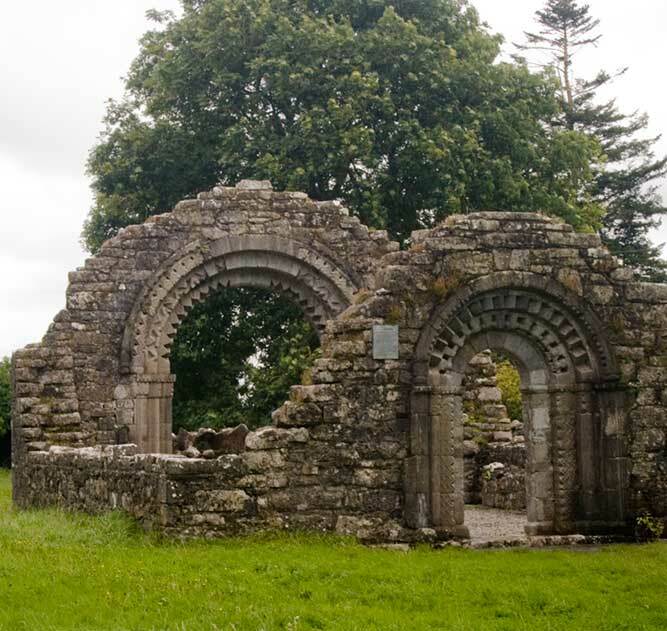 Diarmait Mac Murchada founded Baltinglass Abbey,Co Wicklow, for the Cistercians in 1148 – only a couple of years after the order had arrived in Ireland to found Mellifont Abbey. Diarmait was considered by churchmen to be a modernizing reformer, and was held in high regard by them. On the death of his brother, Diarmait unexpectedly became King of Leinster. He seems to have been a somewhat schizophrenic ruler. On the one hand he gave generously to the church, supporting reforms and founding new monasteries and nunneries (ironically, this seems to have been a speciality of his). However Diarmait was also seen by many as a ruthless tyrant – although this seems to have been the norm at the time. Gerald de Barri (better known as Giraldus Cambrensis) who visited Ireland in 1185 to discover what his cousins the Barrys were up to wrote of Diarmait that he preferred to be feared rather than loved and that he didn’t respect his noblemen, preferring to promote men of low birth (presumably on merit). ‘He was a tyrant to his own subjects……his hand was against every man, and every man’s hand was against him.’ And so it turned out, for Diarmait had abducted, Dervogilla, the wife of Tiernan O’Rourke (perhaps with the woman’s connivance). O’Rourke was the King of Breffny (in modern Sligo and Leitrim) and he appealed to his overlord and ally Rory O’Connor, King of Connacht and High King of Ireland, who led an attack on Diarmait that did such huge damage in Leinster that his own people seem to have revolted against Diarmait. Indeed so endangered was his life, that Diarmait had to flee disguised as a monk. He took ship to Bristol to seek out King Henry in 1166. Dervogilla, the woman whose abduction caused all the trouble for Diarmait Mac Murchada, later founded the lovely Nun’s Church in Clonmacnoise. The church may have been inspired by the fine church architecture commissioned by her abductor! Orpen identifies the place called Korkeran/Corceran as Gort Corceran which is located just east of Ladysbridge, north of the road to Ballymacoda. There is an error in Orpen’s account – he says it is near the mouth of the Dissour River – true, but it is actually on the Womanagh River, which flows into the Dissour just a short distance to the north. Perhaps Olaf O’Cineadha was living in Gort Corceran and he arranged the ship. This man’s Norse-Irish name is interesting and suggests strong intermarriage over the generations between the various Norse settlers in Dublin, Wexford, Waterford and Cork with the native Irish. Given that one of the parishes in the city of Waterford was named for St Olaf – it’s possible that Olaf O’Cineadha had connections there. Whatever the reason, it is clear that the two men knew each other – did Olaf supply ships to take Diarmait’s men to Wales to assist Henry II some years earlier? It has to be admitted that Orpen’s suggestion was greeted with horror by William Henry Grattan Flood in 1904. (Pity the poor man. With that moniker, he had a lot to live up to – named for two celebrated eighteenth century Irish parliamentarians Henry Grattan and Henry Flood!) Grattan Flood insisted that Diarmait left from County Wexford – specifically from Corkerry near New Ross, on the banks of the Barrow in County Wexford. On the surface this looks good – it was in Diarmait’s home territory. 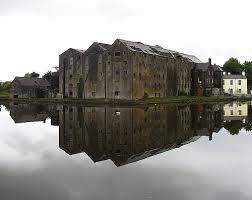 But it also entailed a long trip down the River Barrow passing Waterford – a place with no love to Diarmait. Orpen’s response is firm – he quotes the Song of Dermot and the Earl to say that MacMurchada was driven out by his own people, a detail supported by other evidence from the time. Diarmait was so hounded by his enemies that he had to disguise himself as a monk in order to escape – it suggests the man had a serious popularity deficit, as we would say today. To get a flavour of the vicious nature of Irish politics at the time consider a detail revealed by Dagmar O’Riain-Raedel. She recounts the horrific tale of two rival Irish kings being finally persuaded by the Bishop of Lismore to make a solemn peace with oaths sworn on relics in the cathedral of Lismore. The two rivals duly obliged the bishop. But as soon as they stepped outside the door of the cathedral, having sworn their solemn oaths, one man promptly buried his battle axe in the head of the other. So much for a binding oath to keep the peace in twelfth century Ireland! At least the murderer had the courtesy to wait until he was outside the church before doing the dastardly deed – unlike the Anglo-French knights who murdered Archbishop Thomas Beckett in Canterbury a decade or so later! (Sadly twenty-first century Ireland got a taste of this twelfth century behaviour during the week when gunmen killed a wedding guest the door of a church in Enniskillen as he was about to attend the nuptials – tradition can be wonderful, but some traditions deserve to be firmly consigned to the dustbin of history.) The brutal murder at Lismore suggests that Diarmait Mac Murchada was in very real personal danger of assassination or murder. Hence his flight from Ui Cinnsealagh. According to Orpen, the nearest point where Diarmait could have safely taken ship for England was in East Cork, specifically Youghal (which probably didn’t exist as a town at the time), or Imokilly barony in East Cork. The townland of Gort Corceran is near the middle of Imokilly – and Orpen had already noted the name and location on the Ordnance Survey map of the area. How to resolve a political dispute in twelfth century Ireland. This illustration may refer to the brutal murder at Lismore cathedral and gives a hint of the personal danger that Diarmait Mac Murchada faced when he was defeated by O’Connor and O’Rourke. However there are a couple of details that neither Orpen nor Grattan Flood addressed. The Dissour empties into Youghal Bay, as does the River Blackwater. The Blackwater leads to Lismore, site of the monastic foundation of St Carthage and a place with a long continental connection, as well as being the site of that vicious axe-job! At the time, the Bishop of Lismore was Gilla Crist Ua Connairche, called Christianus in Latin. He was also the Papal Legate in Ireland, so much business pertaining to the Irish church was conducted by shipping passengers, pilgrims and messages from Youghal Bay. As a king with an interest in church reform, Diarmait might have been given a warm welcome by the clergy of the area – including the Papal Legate and the Bishop of Cloyne. Indeed, Diarmait’s flight may have been assisted by churchmen – which very likely explains the monkish disguise he adopted. Also, it should be noted that Gort Corceran is just a few miles from Cloyne. The Cathedral of St Carthage in Lismore, County Waterford, is a medieval structure with much later rebuilding, especially in the early nineteenth century. It is delightfully situated across from the castle gardens. Lismore was the seat of the Papal Legate in the lifetime of Diarmait Mac Murchada. An infamous murder was committed just outside the door of the cathedral in the twelfth century – one king murdered his rival moments after they had sworn an oath inside to keep the peace. Politics, twelfth century Irish style. To make matters even more interesting, the Dissour river flows through Killeagh, just north of Gort Corceran – and Killeagh was originally the cell or monastery of St Ia (NOT St Abban!). St Ia gives her name to St Ives in Cornwall as well as sites in Brittany – suggesting a long history of communication between Killeagh area and foreign shores. In addition it seems that the first two bishops of the restored diocese of Cloyne may have come from the Irish monastery in Regensburg in Germany. With these overseas connections, the idea of Diarmait Mac Murchada taking ship from Youghal Bay, even from the mouth of the Dissour, makes sense. The idea is reinforced by the fact that the Anglo-Normans later founded an important manor and castle at Inchiquin – right on the banks of the Dissour. This allowed them to get supplies directly from England if required. 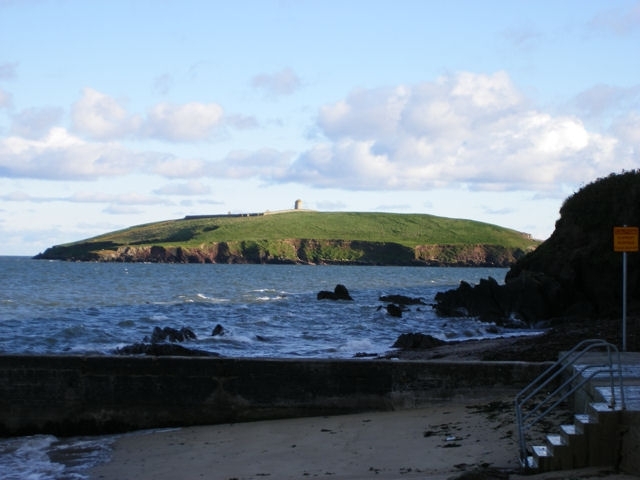 If the bishop of Cloyne was involved in Mac Murchada’s flight, it is possible that Diarmait might have embarked from Ballycotton – a settlement controlled directly by the bishop and a significant harbour at the time (see my previous previous post on Ballycotton). The thirteenth century juliet or round keep of Inchiquin Castle on the banks of the Dissour River. Curiously, the Manor or Seigniory of Inchiquin remained effectively outside the control of the Sheriff of Cork for many centuries. The FitzGeralds were the first to hold the manor. I suspect the jury is still out on Orpen’s suggestion – but it is worth further investigation. Recently, I met Paul Mac Cotter, who wrote the History of the Medieval Diocese of Cloyne, and he said that there were many connections between Wexford, especially south Wexford, and Imokilly in the thirteenth century, shortly after the Anglo Normans settled the place. Perhaps these connections went back to Diarmait Mac Murchada in 1166! Capel Island off Knockadoon Head marks the southern end of Youghal Bay and is close to the mouth of the Dissour River. Named after the de Capella family, an Anglo-Norman family who settled in Imokilly around 1200, it may have been one of the last sights of Ireland seen by Diarmait Mac Murchada as he went to seek aid from King Henry of England. The de Capella family are known today as the Supple family. One thing is clear though – without Diarmait’s trip to see Henry II there would be no FitzGeralds, Butlers, Burkes, FitzMaurices, Supples, Cods, Roches or even Harpurs in Ireland! I’ll update you if I get further information that can shed light in favour of, or against, Orpen’s idea. There is a delightful irony in the fact that William Henry Grattan Flood was born not far from the Dissour River – in Lismore actually. He even spent much of his life in Enniscorthy, County Wexford, as a church organist – right in the heart of Diarmait Mac Murchada’s home territory! This is the man who preserved and published the Wexford Carol – the finest of the native Irish Christmas carols! For that alone we can happily forgive him for his peeved response to Orpen’s suggestion about Diarmait’ Mac Murchada’s flight from Ireland. 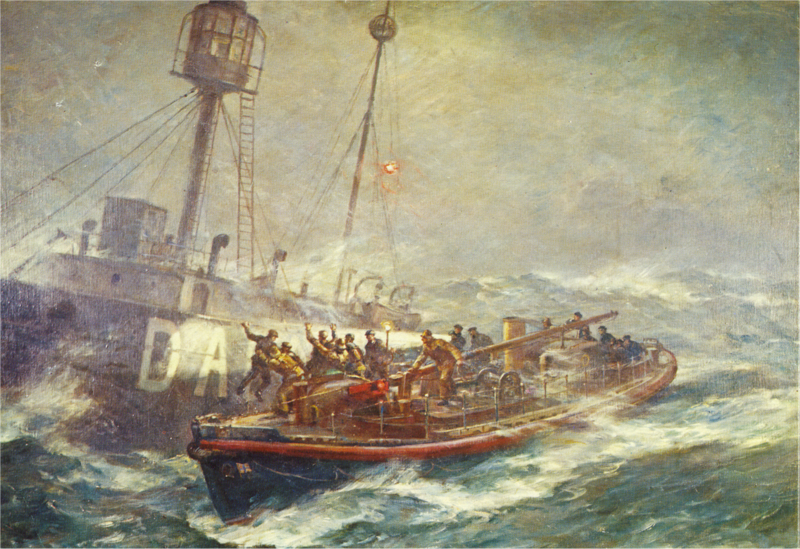 Gribble’s painting of the rescue of the crew of the Daunt Rock Lightship by the Ballycotton-based RNLB Mary Stanford in February 1936. Ballycotton, a small fishing village and holiday destination situated on an east-facing headland in East Cork, is an old village that was once an estate of the Bishop of Cloyne. Settlement in the area goes back many centuries. We know who lived there in the 1200s because the text of the Pipe Roll of Cloyne has survived and been re-edited and republished most recently by Paul MacCotter and Kenneth Nicholls. Unfortunately anyone searching for Ballycotton’s medieval remains will be disappointed, since the medieval village was eroded into the sea centuries ago. 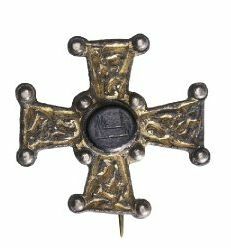 One extraordinary discovery there in the 19th century was a cross brooch from the 8th-9th century. This gold brooch has a central inset with early Arabic script on it which seems to be the earliest Islamic inscription found in Ireland! Clearly Ballycotton was an important harbour in the early medieval period – probably replaced by Ballinacorra as the port for Cloyne at a later date. The present village of Ballycotton dates from the 18th and 19th centuries. The Ballycotton Cross is a brooch found in a bog near Ballycotton in the 19th century. Dating from the 8th or 9th centuries, it contains a black gemstone at the centre with an Islamic inscription in early Arabic script, which is clearly visible in this image! Image: Trustees of the British Museum. Ballycotton’s links to the sea include its valuable service as the base of a lifeboat station of the Royal National Lifeboat Institution since 1858. Nearby Crosshaven (on the western shore of Cork Harbour) and Youghal also boast lifeboat stations – which gives an idea of the dangerous nature of the shore on this stretch of County Cork’s coastline. What makes this shore particlarly treacherous are the shoals or rocks lying just below the surface, for at low tide the viewer can see shelf of rock stretching out to sea – a nasty prospect for any vessel caught in a southerly or south easterly wind blowing hard ashore. This same shelf can provide splendid beaches where there is sand, but it is the rocks that pose a serious threat. To make matters worse, there are a number of rocky islands – two at Ballycotton Head and one at Knockadoon Head. Only one of these islands has a lighthouse – it stands on the larger of the two islands off Ballycotton. In addition, there are lighthouses at Youghal and Roches Point. On 7th February 1936 a huge storm drove a south-easterly gale on to the coast of Cork. This storm developed into something approaching a hurricane. The wind was so strong that the spray from the waves breaking of the cliffs was sent over the lantern of the Ballycotton Lighthouse – over 196 feet above sea level! The mighty stones that made up the breakwater of Ballycotton harbour were ripped up and tossed about. Slates were ripped from the roofs of the houses – and the telephone cables were cut. The fishermen of Ballycotton spent 10th February securing their vessels as best they could in their small harbour. 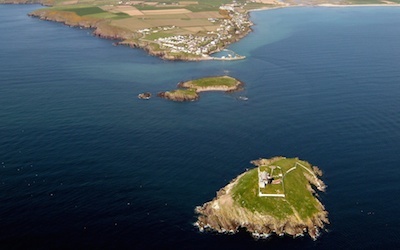 Kevin Dwyer’s aerial image of Ballycotton and its two islands. The lighthouse stands on the island at the bottom of the picture. The storm of 1936 sent spray over this lighthouse – 196 feet above sea level! The small harbour of Ballycotton is visible beyond the smaller island. The Mary Stanford slipped between the two islands on her outward voyage to her famous rescue mission. About 8.00 am on the morning of 11th February, the lifeboat station in Ballycotton received an SOS delivered by car. The station was notified that the Lights Vessel Comet had broken her moorings off Daunt Rock and was drifting towards Ballycotton. The LV Comet was a lightship – a floating lighthouse – on station off the Daunt Rock. This is a dangerous undersea rock that comes perilously close to the surface some miles due south of the resort of Fountainstown (on the western side of Cork Harbour). Lightships were tough, very heavy ships designed to withstand severe storms at sea. Usually lightships were moored above or near a marine hazard to warn shipping of the danger lurking below the waves. A previous lightship at the Daunt Rock had been lost in 1896 – the bodies of the crew were never recovered. However, if a lightship should break her moorings and drift, then because of her strong construction, she would pose a serious hazard to other ships. This wasn’t quite the situation in February 1936 – but it was perilously close to it. The Comet managed to secure an anchor to the sea bed, but it was uncertain how long that would hold in the appalling seas. The lives of eight men were now in grave peril. The Coxswain of the lifeboat, Patrick Sliney, took immediate, but careful action. Conscious of the suicidal nature of the task ahead, and wary of upsetting the villagers, he prohibited the use of maroon flares to alert his volunteer crew. Instead he visited them quietly and asked them to assemble at the lifeboat station. They would take the Mary Stanford out before anybody realised that they were gone. Apart from Patsy Sliney, the Mary Stanford‘s crew that day included:Second Coxswain John Lane Walsh, Motor Mechanic Thomas Sliney, Crewmen Michael Coffey Walsh, John Shea Sliney, William Sliney and Thomas Walsh. To reduce the time it took to get to the Daunt Rock, Sliney took his vessel through the narrow sound between the islands, cutting a half a mile from the journey. As the huge seas crashed over his boat, Sliney counted his men to make sure that nobody had been swept overboard. There was no sign of the lightship, so the Mary Stanford slipped into Cobh to get information on the Comet’s whereabouts. Despite the worsening weather, Sliney took his vessel back out to sea and found that the Comet was now drifting and was just a half a mile from the shore. And she wasn’t alone. At that time, Cork Harbour was still an operational base of the Royal Navy, in accordance with the Anglo-Irish Treaty of 1921. The destroyer HMS Tenedos had stationed herself close to the Comet to assist, but dared not come too close in the wild seas. On reaching the Comet, Sliney’s crew tried to attach a steel cable to the lightship to allow her to be towed to port by the Tenedos – but the cable parted each time. At nightfall, the Mary Stanford returned to Cobh to get a stronger cable. The B & I Lines packet Innisfallen now stood by with the Tenedos to render assistance. Meanwhile the famished crew of the Mary Stanford finally got their first bite of food all day as well as three hours of sleep, and a change of clothing. The storm continued to rage the next day, 12th February, as the Mary Stanford returned to the lightship. By now a fog was making visibility difficult. The Tenedos departed her station and was later replaced by the Irish Lights Vessel Isolde. Rescue was impossible under the weather conditions at the time, so the Mary Stanford stood by for the next twenty-four hours to warn off any shipping. Running low on fuel, the Mary Stanford was obliged to return to Cobh about 7.00 am the next morning, 13th February. Despite the salt burns and seasickness suffered by the crew and an injury to Patsy Sliney’s hand, the Mary Stanford returned to the rescue after refuelling, and permitting her crew a short rest. On arrival, they found that the Irish Lights Vessel Isolde had arrived to tow the lightship to safety, but by now the weather had got even worse, and Isolde was unable to help. As darkness fell, Sliney had the lifeboat’s light beamed on Comet, but the storm now threatened a new danger – the wind changed direction and the lightship was now in danger of being blown onto Daunt Rock itself. The situation was extremely dangerous for the lightship crew, so Patsy Sliney was obliged to take drastic action. The men on the lightship would have to jump aboard the Mary Stanford – if they missed, they would very likely drown! Moving his vessel to the leeward side of the lightship, and having poured petrol on the sea to calm it (to no effect), Sliney placed his heaving boat alongside the lightship and urged the men to jump. One man got aboard on the first attempt. Five got aboard on the third attempt. 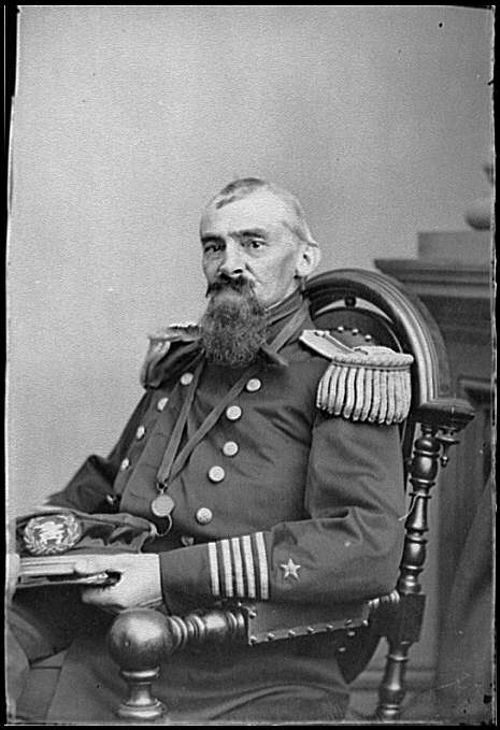 The fourth attempt actually damaged the Mary Stanford – and neither of the two men aboard the lightship had jumped. They were too exhausted. The fifth attempt also failed. Sliney then took drastic action for his sixth attempt – he had some of his crew stand at the bows and, literally, grab the men from the lightship. The procedure was as dangerous to the lifeboatmen as it was to the rescued men. Both the rescued men were injured in the attempt, but they were now safe, and received immediate first aid. The RNLB Mary Stanford returns to Ballycotton after the Daunt Rock lightship rescue. The Mary Stanford could now return to Cobh – but with additional drama, as one of the rescued men lost his nerve and had to be restrained from jumping overboard. After spending the night in Cobh, the RNLB Mary Stanford returned to Ballycotton in fine weather having departed from her home base seventy-nine hours earlier. It was, of course, 14th February – St Valentine’s Day. For their extraordinary rescue of the crew of the Daunt Rock Lightship the volunteer crew of the Mary Stanford were honoured by the RNLI: Patsy Sliney was awarded the RNLI Gold Medal, John Lane Walsh and Thomas Sliney were awarded the Silver Medal and the crewmen, Michael Coffey Walsh, John Shea Sliney, William Sliney, and Thomas Walsh were presented with the Bronze Medal. Looking forlorn and abandoned in dock in Dublin. At least she survived! 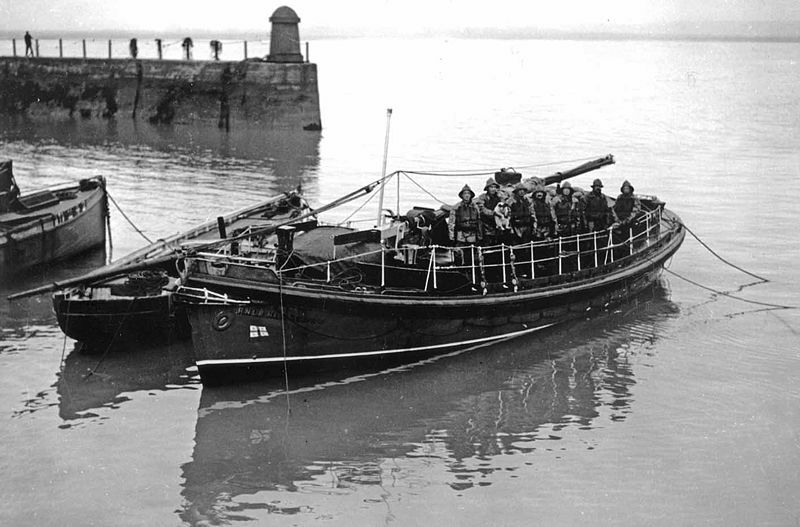 The Mary Stanford served the RNLI until 1959, when she was retired as a reserve lifeboat. In 1969 she was sold to the Limerick Harbour Commissioners to serve as a pilot launch. 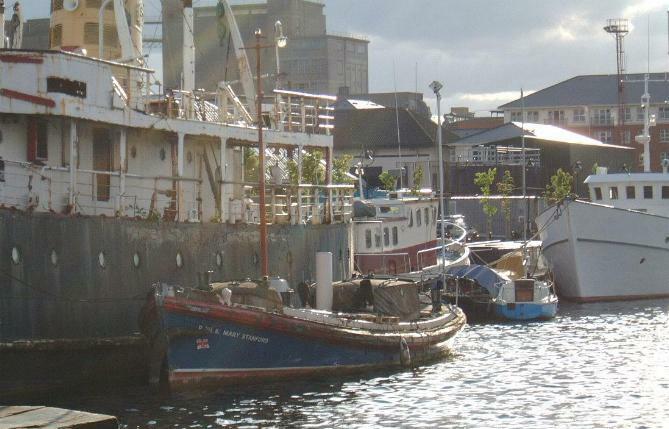 In the 1980s she was acquired by a trust to preserve her at Grand Canal Docks in Dublin. This venture fell through and she was effectively abandoned until a group in Ballycotton decided to rescue her. 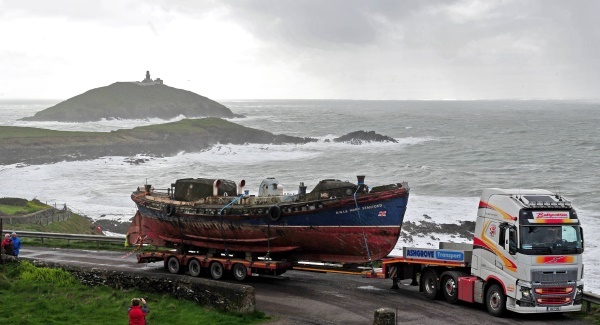 The RNLB Mary Stanford, after a short stop in Midleton, returned home to Ballycotton in the autumn of 2014 to await restoration. Home at last! Now placed overlooking the route she took to rescue the crew of the Daunt Rock lightship, the Mary Stanford awaits restoration. This image shows how high the Ballycotton lighthouse actually is – now you know how bad the storm of 1936 was! The Mary Stanford’s present location marks the start of the Ballycotton Cliff Walk which runs along the cliff that the vessel had to sail past in February 1936 to reach the Daunt Rock Lightship. It is hoped that this cliff walk will eventually extend from Ballycotton to Roches Point, at the entrance to Cork Harbour. Bicentenary of the Battle of Waterloo and Midleton Barracks. 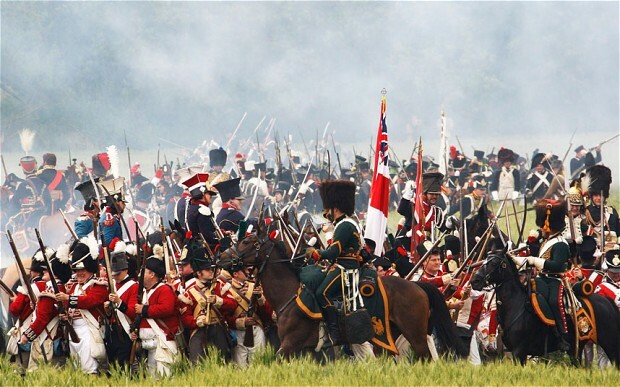 One of the big commemorations this year will be the bicentenary of the battle of Waterloo (June 1815) in which Napoleon was finally defeated. During the Napoleonic War men from Midleton enlisted in the Royal Army and Royal Navy (in the latter case under duress, such as happened to Edward Bransfield of Ballinacorra who was press ganged from his father’s fishing boat). Re-enacting the battle of Waterloo in Belgium. Damian Shiels has posted two very interesting items on his blog: The Midleton Archaeology and Heritage Project (midletonheritage.com). Midleton still preserves the ‘barracks’ that was used by the British and Hanoverian troops – it’s the old woollen mill built by Marcus Lynch in the 1790s and later acquired by the Murphy brothers to become the centerpiece of their distillery! 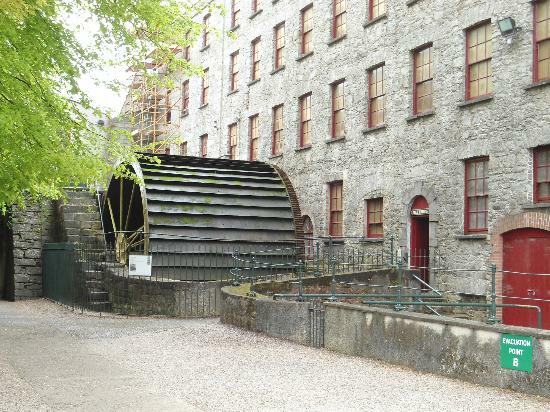 Now part of the Jameson Experience, the vast woollen mill built by Marcus Lynch was acquired by the British Government for £20,000 in 1803 to house troops in transit to Spain and Portugal to fight the French. It later became the centre of the Murphy distillery in Midleton. 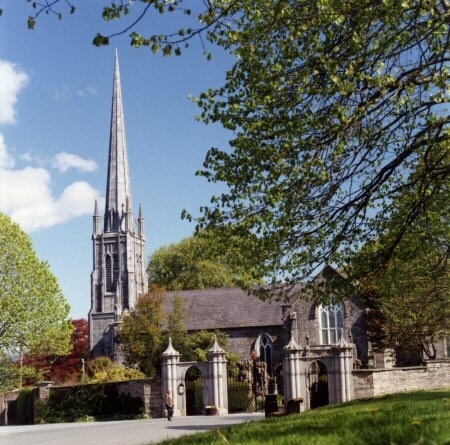 Before Midleton – a church, a village and an abbey. The town of Midleton is about a mile north of the village of Ballinacorra. This village was a small, if busy, port until the middle of the twentieth century, but its origins go back much further. Indeed, it certainly existed in the middle of the twelfth century (1101-1201), although the whole area of Midleton/Ballinacorra had been inhabited since the Bronze Age, at least. 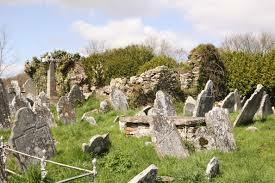 We know that Ballinacorra existed at an early date because the ruined church there is dedicated to St Colman of Cloyne. The diocesan and parochial structures were put in place in Ireland between 1101 (first Synod of Cashel), 1111 (Synod of Rath Breasail – this set up clear a diocesan structure), and 1152 (Synod of Kells/Mellifont – this confirmed, after slight amendments, the modern diocesan structure). The diocese of Cloyne was almost certainly created before his death in 1138 by King Cormac MacCarthy (the man who commissioned Cormac’s Chapel on the Rock of Cashel), and was confirmed in 1152 at Kells. These three synods were native Irish reform initiatives – the basic structure of the Irish church was established before 1160, with the parish network being developed up to about 1200. The churches founded to serve as parish churches, or given new status as parish churches, were all native Irish foundations with, mostly, dedications to native Irish saints. Hence the sprawling parish of Ballinacorra had a church noted between 1177 and 1189 as the ‘great church’ of ‘St Colman of Cor.’ The church at Ballinacorra was dedicated to St Colman of Cloyne – and the location of the church on the banks of the Ballinacorra creek suggests that the associated settlement was probably a port for the episcopal see of Cloyne, just a few miles away. The ‘of Cor’ in the name is a reference to something topographical or a very important local feature – probably a great weir or a series of weirs (I plan to discuss this in another post). Paul MacCotter (A History of the Medieval Diocese of Cloyne, 2013) says that the church of St Colman at Cor was almost certainly founded as the mother church in the western part of Uflanetad – the tuath stretching from the Owenacurra River in the west to the Kiltha River at Castlemartyr in the east. A tuath was a basic Irish political unit ruled by a chieftain or very minor king. Uflanetad (or Ui Fhlannchadha in Irish) was the heartland of the Ui Meic Tire, a family of parvenu nobles who had allied themelves to the MacCarthys and usurped the other local lineages in the area.. In essence the church at Ballinacorra was the equivalent of a minster – a central church that sent out clergy into the surrounding countryside to minister to the people. Strangle as it seems but the modern Roman Catholic parish of Midleton covers almost the same area as Ui Fhlannchadha! All of this was upset in 1177 when the Anglo-Norman knights Robert FitzStephen and Raymond ‘le Gros’ de Carew were given license by King Henry II to take the McCarthy kingdom of Cork. Robert and Raymond had arrived in Ireland by 1169 from England and Wales accompanied by their cousins and colleagues and they set about ‘helping’ Diarmait McMorrough take back his kingdom of Leinster. Henry II’s grant of 1177 was probably the King’s way of keeping two potential trouble-makers thoroughly occupied in a near impossible project. One of the earliest ‘castles’ in County Cork was an earth and timber structure situated at Castra na Corth or Castra Cor or Dun Chureda. This was situated right beside the parish church of St Colman of Cor. This castle was probably founded by the newly settled Anglo-Norman family of des Autres (or de Altaribus). There was certainly a castle there by 1183 when it was burned by Diarmait McCarthy, King of Desmond (Cork). The tall, steep, tree-covered mound in the grounds of Ballinacorra House is almost certainly the remains of this castle (see image above). Monasternenagh Abbey (1148) gives an idea of what the Abbey of Chore might have looked like. The O’Briens, as kings of Thomond, were the wealthy patrons of this particular monastery. With the Anglo-Norman incursion into Cork, the local political arrangements and landholdings were severely upset. In 1179 or 1180 a group of Cistercian monks from Monasternenagh near Croom in modern County Limerick arrived on the banks of the Owenacurra to found a monastery. This became known as Mainistir na Corann, or in Latin, Monasterium de Choro Sancti Benedicti Beatae Mariae Virginae: the monastery ‘de Choro’ of St Benedict of the Blessed Virgin Mary. As part of the establishment, and to avoid conflict with the secular (diocesan) clergy, the sprawling parish of St Colman of Cor was split – the northern part being erected into a new parish attached to and tended by the monastic community. The abbey church also served as a parish church – this was certainly the case at the dissolution of the monastery during the Reformation. St Colman’s church continued to serve the more reduced parish to the south of the new monastic parish. Mellifont in County Louth was founded directly from Clairvaux in Burgundy in 1142. This abbey was the ‘grandmother’ of the abbey at Chore. It is important to note something here. The date of this monastic foundation is three years after Henry II gave Robert FitzStephen and Raymond le Gros leave to take Cork. Despite the much repeated nonsense published by Samuel Lewis in his Topographical Dictionary in 1837, the abbey of Chore was NOT founded by the Fitzgeralds or ANY Anglo-Normans. 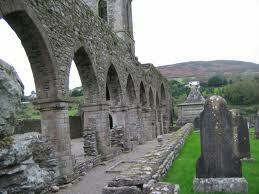 The monks actually came from an Irish Cistercian monastery, Monasternenagh, founded by an irish king. Turlough O’Brian of Thomond, in 1148. The monks who founded Monasternenagh came from Mellifont Abbey, founded by St Malachy of Armagh near Drogheda in County Louth in 1142. THAT monastery was founded directly from Clairvaux in Burgundy with the support and encouragement of St Bernard of Clairvaux. The Barry Fitzgerald mentioned by Lewis is a figment of someone’s imagination. Chore Abbey was a grand-daughter of Mellifont and a great grand-daughter of Clairvaux. It is worth noting that Chore Abbey was founded in the same year that Domhnall Mor O’Brian, King of Thomond, founded Holy Cross Abbey in County Tipperary, probably to celebrate his victory over the Anglo-Normans at Thurles. Holy Cross Abbey in County Tipperary was founded in 1180 – the same year that Chore Abbey was founded on the site of Midleton. Domhnall Mor O’Brian, King of Thomond, brought monks from Monasternenagh to found Holy Cross, probably to celebrate a victory over the Anglo-Normans. (William the Conqueror founded Battle Abbey to celebrate his victory at Hastings.) 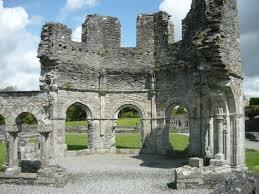 Monasternenagh also supplied the monks who set up Chore! 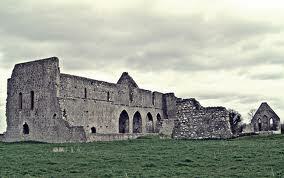 One must wonder if there was anybody left in Monasternenagh when the two new monasteries were founded in 1180! Note the weir in the foreground of this photograph – yet another link to Chore Abbey (Midleton). 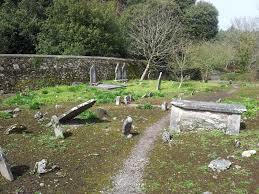 If you visit Midleton today you won’t find a trace of the abbey – it has literally been swept from the face of the earth. 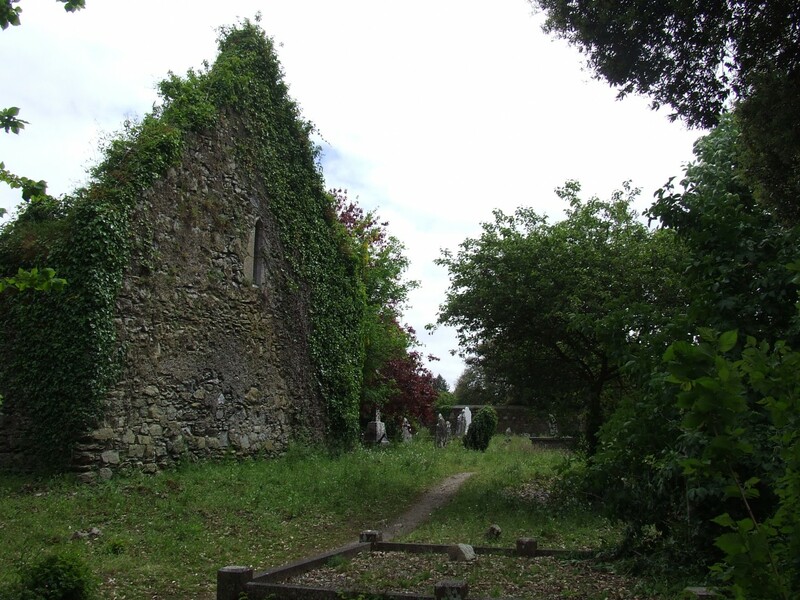 But Ballinacorra still possesses the crumbling ruins of its medieval parish church, situated in its little graveyard, beside the mound that was the castle and beside the creek that leads to the Owenacurra estuary. .